6 tips to keeping it clean and drama-free. First, you have to share a bathroom with siblings, which is inherently annoying. Then, you’re off to college to experience the dreaded communal bathrooms—shower shoes included. The last stop before having a luxurious bathroom all to yourself: sharing one with your roommate in your twenties. Is this as bad as wearing flip flops in the shower? No. But it does take a certain amount of work and communication to navigate sharing a tiny bathroom with one or more roomies. Read on for our six tips to successfully sharing a bathroom as an adult. Bathrooms get gross—fast. Guys and girls fight different battles, but the number one rule to follow is to clean up after yourself. Do you shed when you blow dry your hair? Swiffer that up. Little things add up quickly and are seriously gross to other people even if you might not realize it. Take turns doing the bigger gross stuff, like cleaning the toilet, pulling the hair out of your drain (I know, adulthood, right? ), and mopping the floor (where does all that dust come from?!). Talk about what can be shared and what is off limits. Taking turns buying things like hand soap and toilet paper is to be expected. 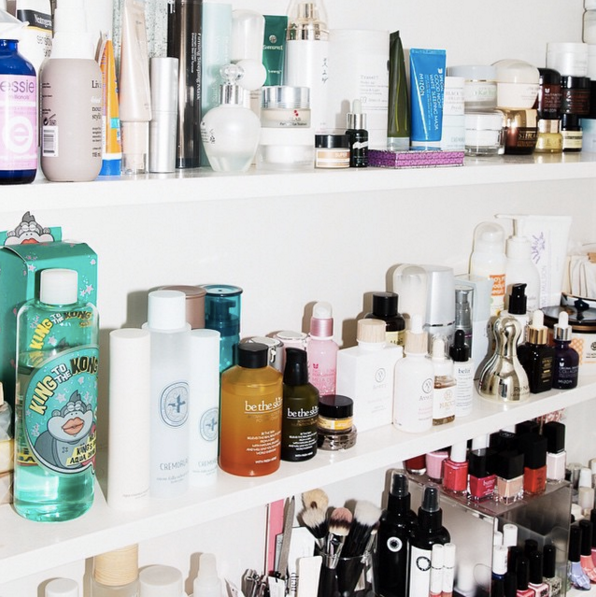 If you keep your makeup, skincare, or hair products in the bathroom, make sure to discuss what is hands off, as most of these products are pricey (save your fave drugstore finds). Even the cost of necessary toiletries like shampoo and toothpaste can add up fast! Establish boundaries in the beginning to avoid conflict later. Getting up and out of the house (in a hurry) each morning is hard enough without worrying about dodging your roomie. Confirm when everyone needs the bathroom so there are no surprises—or greasy hair for that important meeting. Hopefully, knowing you have to stick to a predetermined schedule will help you skip the snooze button, too. Where possible, try completing tasks that aren’t vital to the bathroom, such as makeup, in your room instead. You should wash your towels every 3 days. For most busy 20-somethings, that feels unrealistic. Even if you don’t wash your towels that often, make sure you and your roomie(s) get into the habit of each washing them every few days. Also know which towels are for personal use (like face washing, toothpaste mouth) and which are for guests and hand drying. Germs are real, people! The bathrooms you share in your twenties probably aren’t the most spacious—and are most likely lacking adequate storage for all of your products. Be sure to split the space equally and not monopolize the storage. Designate a number of shelves for each roomie and don’t encroach on others’ space. Bottom line, just try your hardest not to be gross. Most of the time, bathroom stuff is unpleasant to think about AND clean. Different people have different habits and preferences (like leaving toothpaste in the sink vs. keeping it squeaky clean) that have the potential for drama. Talk it out before people get mad and things get really awkward. Generally speaking, casually cleaning your bathroom once a week is not a bad idea. Small things like using a garbage can liner and keeping cleaning supplies in your bathroom will make it easier to take care of chores that are easy to avoid.